Come on in, grab a beverage and get comfy. Let's get to know each other. I’d like to be organized. I pretend I’m organized all the time. One day I will be organized, hopefully by osmosis. However, there are times when my pretend organized state collides with reality. Hence, I’m adding a new heading to my menu. It’s called, “Make it Yourself! !” I’m so tired of finding great sounding recipes that call for items, such as a can of cream of this or that or self-rising flour, only to find I don’t have it on hand. Sometimes it’s because I get a wild hair and I wanna try a recipe NOW. Other times it’s because I didn’t get it from the store because I was rushed or they were out it. Without the item, I have to change my menu plans. Besides, I like making things from scratch – ok, I like making EVERYTHING from scratch! Anyway, why not!! Most of the time it’s healthier and cheaper!! Does that make me a food snob?!! No, it makes me look ORGANIZED! Granted I can’t make beef from scratch but if the recipe calls for chunks ‘o steak, I can substitute it with chicken or pork. Sometimes just to make a recipe lighter, chicken or pork is substituted anyway. But then too, I can’t make a green pepper or a carrot (neither of which are planted in our garden) but for some things there are substitutions and/or omissions (I say that ’cause we don’t like cooked green peppers so . . . Prang!! (visualize me tapping my prairie godmother wand) Green pepper omitted! For each 1 cup of self rising flour the recipe calls for, measure the same amount of all-purpose flour and put it into a separate bowl. Add 1 1/4 teaspoons of baking powder and 1/4 teaspoon of salt to the all-purpose flour. Whisk thoroughly to combine. Use everything that’s in the bowl. Don’t think that that’s too much for the amount of flour. It will be perfect! Trust me. Let’s say your recipe calls for 3 cups of self rising flour. In a separate bowl, measure 3 cups of all-purpose flour. To the all-purpose flour, add 3 3/4 teaspoons of baking powder. Also add 3/4 teaspoon of salt (it can be either Kosher or regular). Whisk to incorporate thoroughly. Add the flour mixture to the other ingredients when the recipe tells you to add the self rising flour. Now, if you’d like to have a supply of self rising flour – let’s say you REALLY like the recipe you just made but don’t want to have to find this recipe every time you make it, make a larger batch of it. The flour mixture will keep in an airtight container, with a bay leaf (meal worms don’t like bay leaves – just in case your container isn’t as airtight as you hoped), for a long time in your cabinet. Let’s start with 6 cups of all-purpose flour. To that add 2 1/2 tablespoons of baking powder and 1 1/2 teaspoons of salt. Whisk thoroughly. On a small card or piece of paper, copy this recipe and place it in a sandwich/snack baggie and put it at the bottom of the container. Dump your newly made self rising flour into the container along with the bay leaf. When your recipe calls for self rising flour, you have it!! Measure it as you would from a bag of store-bought self rising flour (just be sure you see the bay leaf still sitting in your container and not in your recipe mixing bowl!). When you run low, the recipe will be in the bottom of the container, hopefully along with the bay leaf. You can reuse that bay leaf for a long time! And now you’re off and running with the rest of your recipe as if nothing ever happened!!!! See what I mean?!!! That’s easy, right?!!! And wasn’t that better than having to go change your clothes (so as not to appear in the latest edition of the Wal-martians email!!! ), let the dog out (we’re waiting, we’re waiting, oh great!! He found a squirrel in the tree and has wound himself around the tree 2 or 3 times and now you gotta go get him – oh wait, that’s just our dog, sorry. ), find your car keys, either cool down or warm up the car. WHEW!! I’d MUCH rather make the self rising flour myself!!!!! You can do this!!!! And that makes you SO what ? ?. . . ORGANIZED!! Well now that we have the self rising flour under our belt, let’s venture out to cake flour!! Yeah, I know!!!!! You can make cake flour too!!!! For each 1 cup of the cake flour that your recipe calls for, measure out 3/4 of a cup of all-purpose flour into a separate bowl. Add 2 tablespoons of cornstarch to the all-purpose flour. Whisk thoroughly to combine. That’s it! So let’s say your recipe calls for 2 1/4 cups of cake flour. In a separate bowl, measure out 1 1/2 cups, plus 3 tablespoons, of all-purpose flour. To that add 4 1/2 tablespoons of cornstarch. Whisk the dry ingredients thoroughly, then continue following the recipe as if you had cake flour all along by adding the recipe’s remaining dry ingredients to this separate bowl! Voila! Really, when it comes to bread flour, unless you’re a frequent bread maker, the chances of your having the additive on hand that will make the all-purpose flour most like bread flour is probably slim-to-none. But, lest I judge, here’s the additive; it’s 1 teaspoon of Vital Wheat Gluten added to 1 cup of all-purpose flour for every 1 cup of bread flour that the recipe needs. 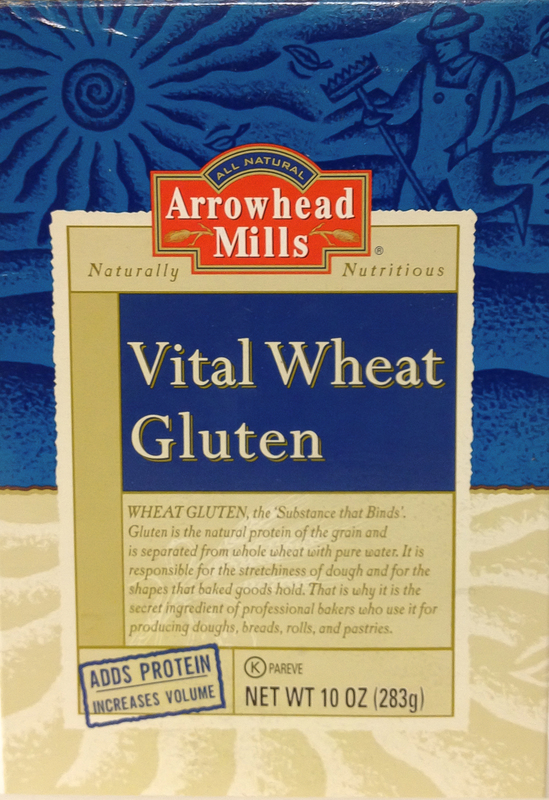 The vital wheat gluten is common enough that Walmart even sells it. Bread flour has a higher protein level (the muscles needed to create the stretchy stuff in the dough) than the all-purpose flour. By adding the vital wheat gluten, it gives the all-purpose flour the extra muscle it needs to help the bread rise tall and keep those muscles flexed through the baking. So as not to waste any of your all-purpose flour or the vital wheat gluten, measure for the minimum amount of bread flour that your recipe calls for. If your recipe calls for 3-4 cups of bread flour – use 3 cups of all-purpose and 3 teaspoons of the vital wheat gluten for 3 cups of the bread flour. That fourth cup (which you may only end up using half of) if it’s just all-purpose flour isn’t gonna break the bread. Likewise if you need just a bit more than that last cup, the additional all-purpose isn’t going to hurt it. If you don’t have the bread flour or the vital wheat gluten on hand, don’t worry about it. You can go ahead and make the bread, rolls, etc. with all-purpose flour. The final product will still be very good; it will just be “softer” than if made with bread flour. However, there are a couple of things I can think of that you would have better results with if you either bought the bread flour or were sure to use the vital wheat gluten. I’m referring to rustic loaves and baguettes. Since those are handled a little more aggressively after the “formed” rise (rather than just baking them in the same pan they had their rise in), they’re more vulnerable to deflating. However, if you are using a baguette pan, or if the “formed” shape will only need to be slid onto a pizza peel or the back of a baking sheet to be moved to the oven, then by all means go for it with the all-purpose flour. The rustic loaves that are baked in a dutch oven or baguettes that are transferred to a baking sheet after rising in towels can deflate very easily with the bread flour so there’s even a greater chance without the muscle of the extra gluten in the flour. I’d hate for you to invest the time and money on something that’s more prone to fail from the get-go. There have been times when I’ve accidentally used all-purpose flour instead of bread flour, particularly in rolls, and come to find out, we really liked it better!!! I’m also noticing that more and more roll recipes are calling for all-purpose flour. Now I know there are gonna be some foodies out there that are gonna say, “How can she condone not using bread flour when it’s called for?!! !” Did you use a Truman Capote voice when you read that question? That’s what I had in mind. Anyway, my reply is this; I say for the beginner bread maker who just got a wild hair (ya know, I use that term a lot – I must get a lot of ’em!) and wants to experience (and it is an experience) making a loaf of bread or a batch of rolls, go for it! How could anyone whose made bread before, deny a “newby” of experiencing the smell of the yeast after the bread has risen, to feel the soft suppleness of the dough (yes, you DO have to put it down at some point) and to see it magically rise. And the aroma . . . the aroma of freshly baked bread coming from YOUR oven, from YOUR kitchen, made with YOUR hands!!!! Oh my word!!!! BUT, the best part is when the bread SINGS after it comes out of the oven. Oh yeah! When you roll that loaf of bread from the pan onto the cooling rack, listen and you’ll hear it crackle as it cools. It’s saying “I will bless you!”. Slather that crust with soft butter shamelessly, I tell you, slather it!! Now let it rest and cool. AND THAT’S NOT EVEN THE BEST PART!! While the bread is still just a little bit warm, and you can no longer keep your family at bay, slice into it!! Feel how the knife works through the crispy crust, and then, just seems to weightlessly glide through the fleshy interior. Gently, tenderly smear the softened butter onto the slice. Serve that thick slice of heel as if it were the passing of the family crest to your children. As your taste buds make contact with the salty buttery exterior, you can hear an angelic choir in full crescendo!!! As your teeth sink into the soft, warm and buttery interior, goosebumps are expelled at rocket speed and explode all over your body!! Oh yeah, it’s an experience all right!! Who could deny anyone moments like those just because there’s no bread flour in the house?!! So, if you decide the bread flour is too expensive, stick with mixing the all-purpose and the vital wheat gluten. Just relax, use what you have. When the aroma of the bread, rolls or whatever you’re baking makes it’s way throughout the house, onto the porch and into the neighborhood, you’re gonna be real popular, real fast!! Believe it or not, you can make your own baking powder!!! I know!!! Hey, am I the go-to-girl or what?!!! Keep in mind though, this is NOT double-acting baking powder. The difference between the regular (this recipe) and the double-acting is this: the regular is activated (gets your ingredients to start getting puffy, or rising) when it comes into contact with a liquid. The double-acting gets your ingredients moving when it comes into contact with a liquid and then again when the heat from your oven hits it. I’ve had only one recipe in my life that specifically called for the double-acting baking powder. Mostly recipes just call for baking power – however, I do always buy the double-acting. This isn’t something I’d be interested in making a container of for future use but it’s nice to know how to make it if I’m in a pinch. As I said, I’m interested in the double-acting anyway. Not having buttermilk on hand has happened to me more times than I care to count!!! I start to make biscuits or come across a recipe and I have no buttermilk. 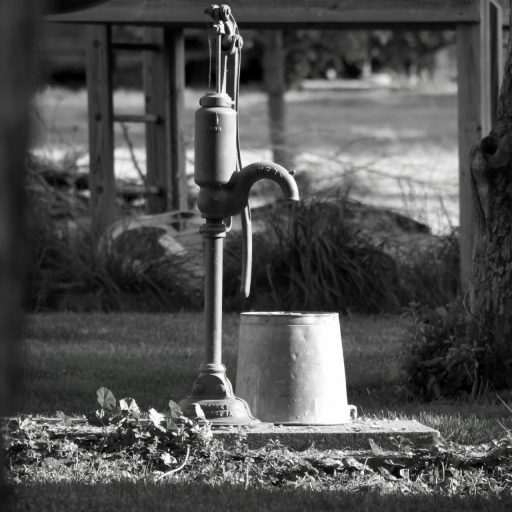 Plus, milk of any kind is so bloomin’ expensive nowadays, it’s ridiculous!! And no, I don’t blame the farmers! Of course the easiest, and most cost effective, way to make a buttermilk substitute is to make sour milk. To make sour milk (for 1 cup) pour 1 tablespoon of white vinegar into at least a 1-cup liquid measuring cup. Add enough milk to bring the milk mixture up to the 1 cup line. You don’t want to measure the milk first unless you’re going to remove a tablespoon of it before you add the vinegar. You want the TOTAL measurement to be 1 cup for every 1 cup of buttermilk. Let the vinegar/milk mixture sit on the counter for about 5 minutes or until it gets “lumpy”. DON’T stir it before you add it to the recipe. So, if your recipe calls for 2 cups of buttermilk, pour 2 tablespoons of vinegar into the measuring cup, then enough milk to bring the measurement to 2 cups. Let sit on the counter for 5 minutes then add to the recipe as it calls for it. Another alternative to have on hand is buttermilk powder. 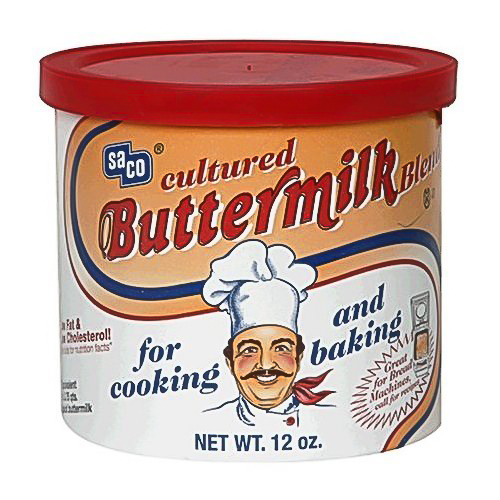 The product I’ve tried (and will never leave) is SACO Cultured Buttermilk powder. I’ve found it at Walmart in their baking aisle. It stores on your self, prior to opening, and in your refrigerator, after opening. I’ve always run out of it before it expires. If your recipe calls for 1 cup of buttermilk, you use only 1/4 cup of the powder (and add it to the dry ingredients) and 1 cup of water (added when the recipe calls for the buttermilk). It is kinda pricy but when you think about how long it lasts, compared to buying liquid buttermilk, only using a cup or two and hoping you find something else to use it for, or freezing it in ice cube trays before it goes bad, this is a pretty great deal. SIDE NOTE: There was no compensation to the owner of this blog for endorsement of this product. You were supposed to read that really fast like the guy at the end of the commercials with the disclaimer. Should we go back and read it again, faster this time? Either way, at least you know there’s an alternative should you not have the powder or the real thing on hand. You don’t have to do without making the recipe!! Isn’t this stuff just cool to know?!!??!!! Class is now dismissed. You are free to move about the cabin. MAJOR SIDE NOTE: Speaking of being out of things, I am SO THANKFUL for my iPhone. (Huh? What’s that have to do with recipe substitutions?!!) Some may look at an iPhone as a luxury or a splurggance (yep, that’s my new word and I’m stickin to it. I thought 2 g’s made it look more reputable), but I have our whole house and lives on my phone!! Seriously!! When I run out of something I go right to my phone and put it on my “Notes” app, under the appropriate heading of where I’m going to buy it. If I don’t type it in right then, I forget to do it later. I LOVE “Notes”!!! With “Notes”, I’m never without my grocery list, my errand list or any other list I may have made at some point. Not only is it so wonderful for immediately recording what I just ran out of, as I said, I have a page designated for “Walmart”, “Sam’s”, “County Market” and “Meijer”. I list the things I want to buy under their headings as I look through the weekly ads and make my menu. I’ve even put our menu on “Notes”. SIDE NOTE: Ok you may be thinking that whatever cash I’m trying to save on groceries is going toward gas by going to all those stores, but to you I say “No, no, noooooo! (politely of course). Near us, Sam’s, County Market and Meijer are all in a VERY close proximity so I DO save cash!! However, if you have to go hither, yither and yon (I don’t think I’ve ever been to any of those places) it’s something to consider whether you’re really saving anything. Something to also keep in mind about price matching at the grocery stores is that County Market and Meijer DO NOT price match. And that stinks! The other thing is that even though Walmart does price match, it must be name brand items. If County Market has their store brand milk 2/$5, Walmart will not price match. If it’s Prairie Farms, Dean’s, any nationally known company, 2/$5, Walmart will match it. It has to be brand name rather than store brand. Big difference, disappointingly so. I really hope this has been beneficial for you and has made us both look really . . . well, organized, of course! I know how frustrated I get when I don’t have what I need on hand. If I can find an equal substitute, by golly I’m goin for it! So, until I have a stocked pantry that would make the folks from Food Network say, “Whoa!! What a great pantry you have! !” I guess I’ll continue to look for, and share, more substitution suggestions for us. Happy baking!